While in Traverse City recently I visited a wonderful tea shop – the Spice & Tea Merchants shop. It’s a cozy little store with wonderful smells of spices and teas. I probably could have spent hours just gawking at all the tea. I bought a couple of teas while there, one of which was a “Canadian Ice Wine” black tea blend. The tea blends ice wine, black tea, white tea, and freeze dried grapes. I’ll admit I bought it just because it seemed very different and it was Canadian based even though it was being sold at a shop in the US. The tea really smells strongly like grapes. 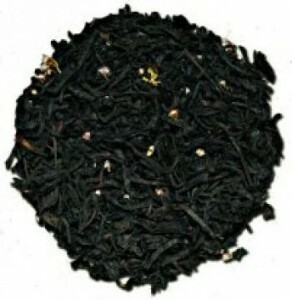 The taste is a bit more subtle – the black tea is fairly prominent and is complimented by a fruity undertone. It’s an interesting combination. I’m not sure it would start buying it in bulk but I’m definitely glad I tried it. For Mothers’ Day Andrew and Little Miss surprised me with a homemade Doctor Who themed card and a whole lot of tea. Pretty much the perfect gift in my mind and encompasses two of my favourite things. The tea gift included a number of selections from Teavana which I’m still working my way through. 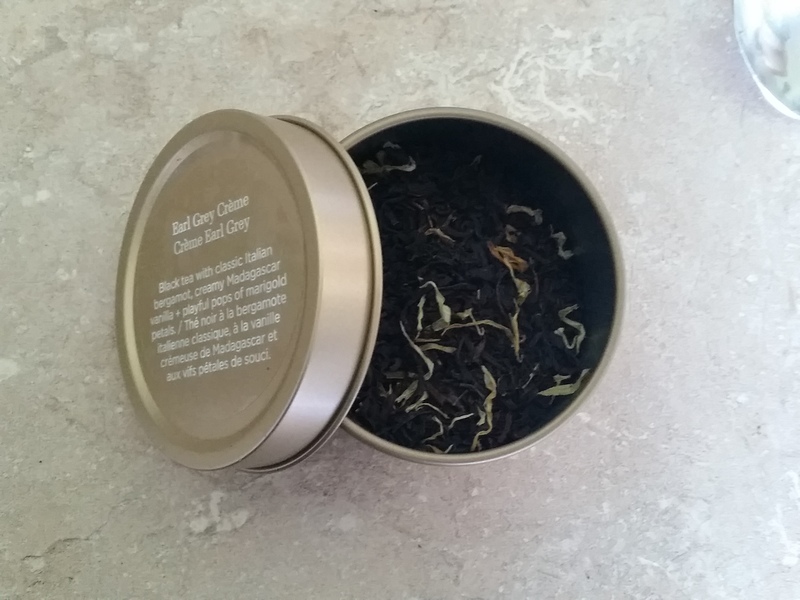 The first tea I’ve tried was the classic Earl Grey Creme (EGC) black tea. I love my Earl Grey tea generally and it’s one of the DavidsTea selections I’ve come to enjoy on a regular basis. (Yes, I have a tea addiction…I’m okay with that.) The Teavana Early Grey Creme selection includes vanilla which mellows the dominant flavour of the bergamot. Which I gather is the idea behind EGCs generally, it has the potential to be a subtler version of Earl Grey. This was decent a cuppa. But I love a strong cup of Earl Grey so EGCs probably aren’t being marketed to me. I did like the subtle flavours and additional depth in this tea, but missed the strength bergamot that is in some Early Grey teas. On to more tasty teas. French toast in a cup! Well kind of. This black tea has cinnamon, lemon peel, coriander seeds, cardamom, coconut sugar, and cane sugar. 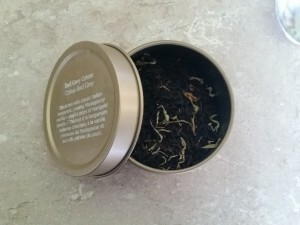 This tea was a rich black tea with a slightly buttery tone and a hint of spice. I’m not sure what liquid french toast would actually taste like but I imagine this is a fairly close (albeit mild) version of that. And I’m not about to blend up actual french toast to find out. I had this tea in the evening but think it would pair well with a morning snack or breakfast. It’s mild enough that I could drink it early in the morning without being overwhelming by the non-tea falvours. A decent tea. Day 18 and day 19 were two very different teas. Forever Nuts was another fruit infusion that doesn’t have any actual tea in it. It is a mix of apples, almonds, cinnamon, beetroot, and artificial flavor. It reminded me of the banana nut bread tea though this was apple fruity instead of banana. It poured a light red and you could smell the cinnamon. It reminded me of apple cider. On the other hand the Dark Chocolate Delight tea was actual black tea infused with spiced dark chocolate, blueberries, cocoa shells and a mild chocolate flavor. I even convinced Andrew to have a taste of this one — it was too tea tasting for is like but not bad. I found his description funny as I was wishing there was more of a tea taste. Different preferences in hot beverages! This selection was a mild version of Hot Chocolate tea… with a barely noticeable hint of blueberry. So basically day 18 and day 19 felt a bit like repeats to me. They were both very similar to teas already included in the advent calendar. 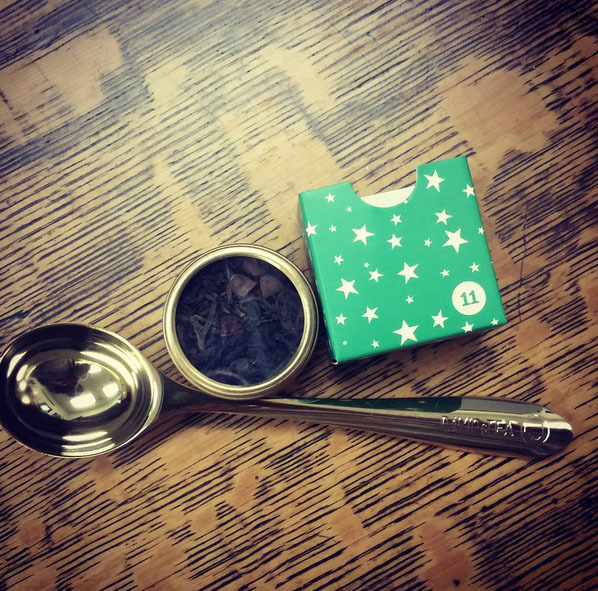 I wasn’t overly excited when I opened today’s little box of tea from the advent tea calendar. A tea named hot chocolate does not sound like a good way to start the morning. This is also one of the tea’s that has a huge list of ingredients: Pu’erh tea, black tea, cocoa nibs, chocolate chips (sugar, chocolate liquor, cocoa butter, soy lecithin, vanilla), chocolate curls (sugar, cocoa butter, whole milk powder, chocolate liquor, whey powder, lactose, soy lecithin, vanilla), stevia extract. It’s tea that is designed to taste like hot chocolate. It smells sweet and like a mug of coco. I didn’t expect to like this tea but it wasn’t nearly as overpoweringly sweet as I anticipated. I love that you can actually see chunks of chocolate in the dry tea – it’s not just all added sweetener. Another black tea! This organic black tea from Nepal is apparently sources from “from a small family-owned tea garden named Jun Chiyabari.” The dry leaves are thin, long, and slightly curled and smell slightly malty. The tea has a slightly honey note and a very mild astrignecy. It’s a fairly standard black tea and I could see it becoming bitter if you let it over steep — I was at work and not paying a ton of attention to the tea making process and it was borderline over-steeped. A nice simple tea with a dash of honey sweetness. The name of today’s tea, Glitter and Gold, reminded me of one of my favourite Tolkien passages. Not all those who wander are lost. And not all tea that has glitter in it’s name is actually made of gold. Though there are gold coloured stars in the loose leaf tea, which apparently sparkle when steeping. Mine might have sparkled — but I wasn’t paying close enough attention to notice. Brewing it in a glass or white coloured mug or pot might bring out the sparkle a bit more. The tea smells like cloves, cinnamon and a hint of ginger. This black tea is slightly sweet and the cinnamon really comes through as the dominant spice. I think this would pair well with some homemade gingerbread cookies or a snowy day. This tea is probably my favourite so far from the #24daysoftea. After two days of flavoured fruity teas I was actually pretty overjoyed this morning to discover that today’s tea is a simple loose leaf orange pekoe. Being a black tea this selection actually has caffeine which is also a nice change to the previous two days. When I think of curling up with a book and some tea I tend to think of black tea. This particular tea is a fairly standard orange pekoe, nothing fancy but tasty. I’ve had better (think loose leaf tea bought in England) but I thoroughly enjoyed this morning’s cup of tea.